Will lobbying your MP really work? Asking your MP to represent your political concerns is the backbone of democracy in the UK. Many people feel that either their voice is too small to be heard, they will be brushed aside or are unsure how to go about contacting their MP. All of this places upholding our democratic right to be heard in danger. However, contacting your MP is worth it and what’s more, is really easy to do! 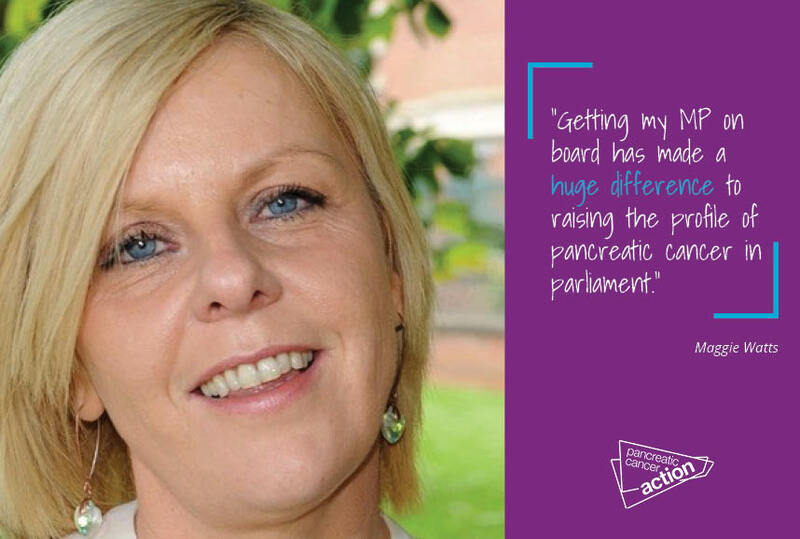 Read Maggie’s Story about how she got the attention of her local MP who is now supporting Pancreatic Cancer Action. MP, Nic Dakin was inspired by local constituent Maggie Watt’s astonishing story. Maggie’s husband, Kevin, died age 48 of pancreatic cancer in 2009 exactly 40 years after Kevin’s mother died of the same disease. During this time, the survival rate of pancreatic cancer had not changed at all. So Maggie decided to take action and do something about it. She started an on-line petition which called for better awareness, swifter diagnosis and more research funding for pancreatic cancer. The petition achieved more than 106,000 signatures and resulted in a debate in the House of Commons in September 2014. Maggie’s petition inspired her local MP Nic Dakin to get on board and ever since he has been determined to support Maggie by raising the profile of pancreatic cancer in parliament. As well as backing the petition Nic is now the chair of the All-Party Parliamentary Group for pancreatic cancer and also ran the London Marathon! There are lots of ways to engage your MP with pancreatic cancer – you don’t have to start a petition, you could write them a letter or simply tweet them!